Two weeks ago I was just on day two of a cruise. Not bragging, just setting the stage, trust me! The cruise was on Celebrity Summit. This is my favorite size ship, approximately 2100 passengers. She is the sister to my favorite ship, Infinity, where I’ve spent 49 days so far! Same basic design and style, so Summit felt quite homey even though I’ve never sailed her before. She was my home for a week cruise to Bermuda. The cruise was a culinary theme one, featuring two guest chefs and special cooking demos and events. I’ve done two others like this. One a rum themed one on Infinity back in 2001 and another for a chef conference in 2004 on Royal Caribbean’s Enchantment of the Seas. For me, a cruise is always about the food! One of the reasons I love Celebrity so much is the attention to detail on food. They also have a great wine program and staff, but that is a topic for another post. The attention to detail shines through on speciality dining room dishes most of all. 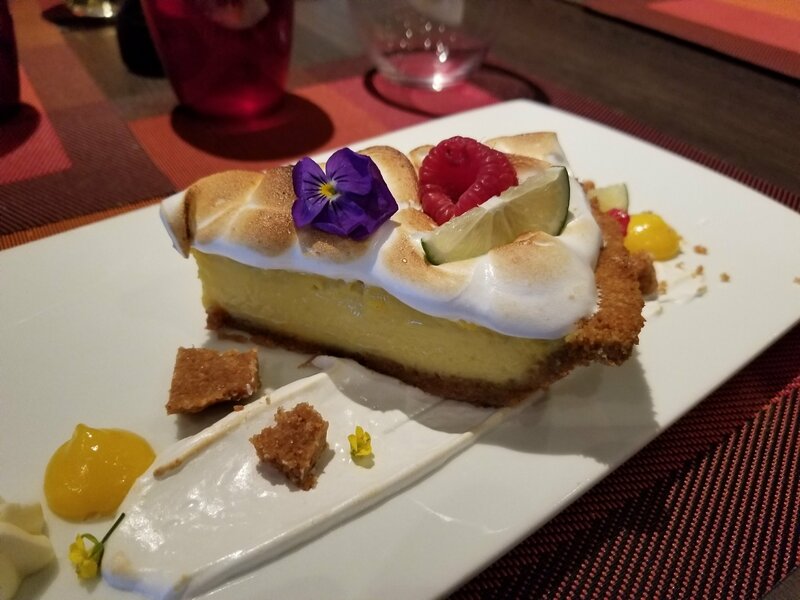 Below is the dessert for our private cooking class lunch, just as an example (and because dessert should always come first!). It was tasty right down to the flower garnish! Key lime pie, photo by Jen Sternfeld. For our class, a group of less than 20 people worked in the galley of the Tuscan Grille dining room. This is one of the speciality dining rooms onboard. They are only open for dinner and special events, so the space was quiet for our class. If you’ve ever seen a commercial kitchen, a ship galley is the same, in miniature. We made the appetizer course for our three course lunch. 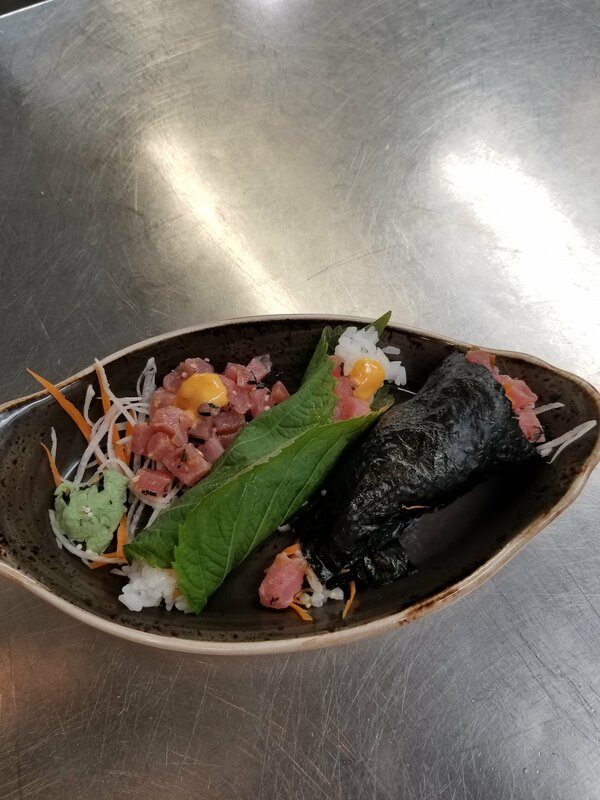 Officially it was Sesame Hand Rolls, but we were shown several ways to make it, so being an overachiever, I did them all. 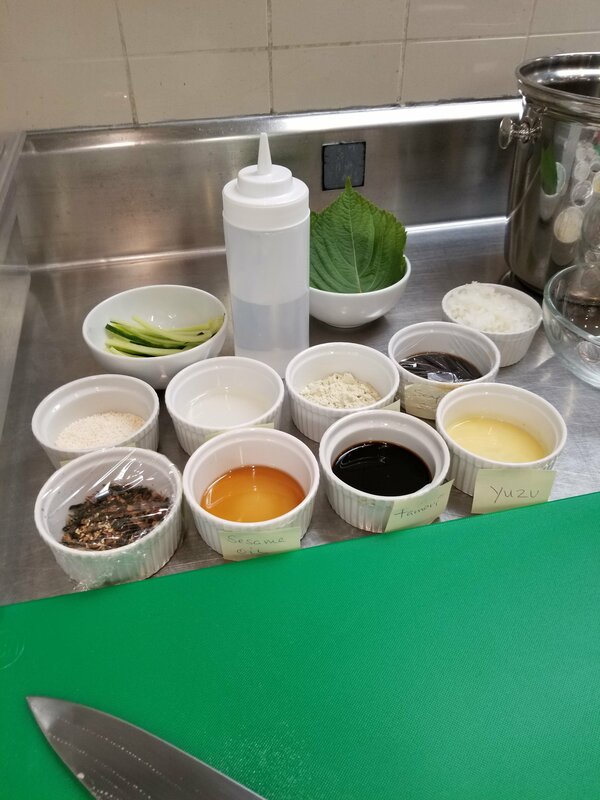 From left to right, salad version, taco in shiso leaf and hand roll. Since it was a sea day, the ship was moving. For a seasoned cruiser, it was going slow (just 11 knots), but I’m sure kitchen safety was on someone’s mind when they planned to have us do a cold appetizer. We did get very large knives, but also metal gauntlet gloves for our off hand, so no injuries! Here is my station before I got started. Lots of seasonings and just the tip of my 12 inch knife! It was a joy to get to “cook” even a tiny bit on vacation. It is one of the things I miss most when I’m away! 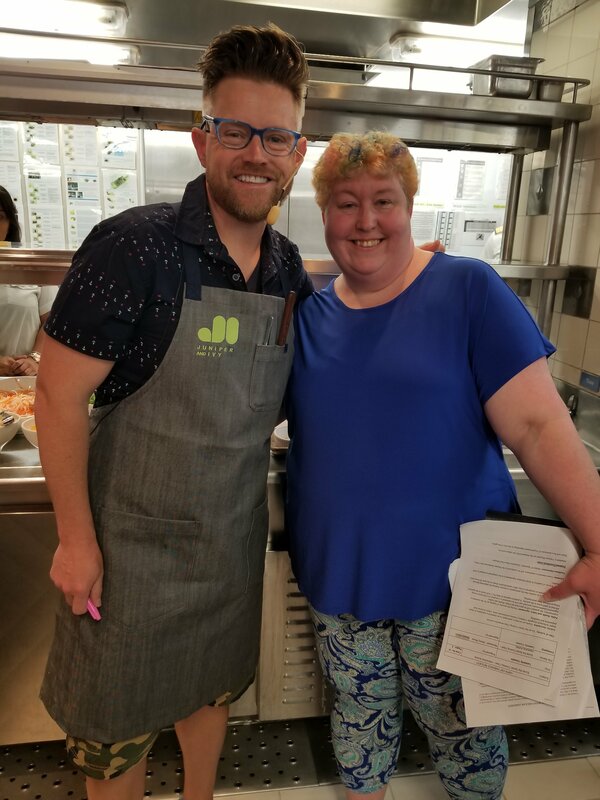 Final shot, posing with our guest chef Richard Blais. Photo by the Celebrity social media coordinator.